Liveaboard scuba diving in Seychelles is an adventure taking you to some of the most unique diving anywhere in the world. Liveaboards in Seychelles offer sailing trips for divers and non-divers alike from the comforts of modern yachts or traditional schooners. Renown also for their granitic island formations, the Seychelles offers both granite-based reefs as well as the more common carbonate tropical reefs, both flourishing with diverse marine life. 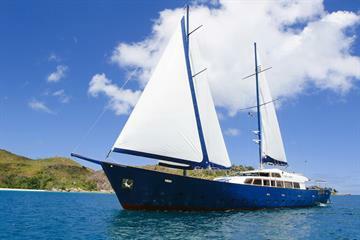 A great choice for divers to explore this fantastic dive area onboard a comfortable liveaboard. The Republic of Seychelles are geographically a part of Africa located 1600km (994mi) east of Kenya, in the west part of the Indian Ocean. To the south-west lie the islands of Madagascar and to the south-east are the islands of Mauritius and Réunion. An archipelago of 115 islands dot the blue ocean just south of the equator with up to 42 granite islands and about 73 coral islands recognised as two main groups of Inner Islands and Outer Islands. The Inner Islands are part of a shallow plateau; average depths are between 8-30 meters with easy conditions. Common fish species include angelfish, butterflyfish, octopus, lionfish, nudibranchs, mantis shrimp, batfish, sharks, moray eels etc. The remote Outer Islands have dramatic drop offs, expansive reefs, walls, pinnacles, wrecks and canyons providing a diverse marine environment, teeming with marine life. Napoleon wrasses, schools of bumphead parrotfish, stingrays, reef sharks and green/hawksbill turtles roam these waters. Be sure to look into the blue for Sailfish, silvertips, oceanic whitetips, manta rays, whale sharks and rare lucky sightings of hammerhead sharks. The length of most Liveaboard itineraries to Seychelles are 8 days / 7 nights and some boats can accommodate up to 18 guests. Land-based activities available onboard provide the opportunity to visit the Seychelles and its beautiful islands, through nature reserve trips, trekking around national parks and general sightseeing tours. For the non-diver, other water-based activities including snorkelling, kayaking and stand up paddle are available on some itineraries. Dedicated liveaboard trips include visits to dive sites around the different islands of Mahé, Praslin, La Digue, Curieuse, Little Sister and Grand Sister. These islands offer endless opportunities for world-class diving. 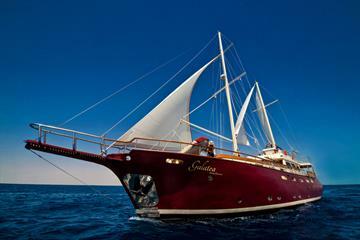 Most liveaboard itineraries include up to 10 dives per trip. Mahé offers fascinating and diverse diving. As well as a few shipwrecks, Mahé hosts the elusive Whale Shark during October/November. Worth a visit just for its’ landscape is North Mahé’s popular Beau Vallon beach. Dive site to Lighthouse. To the north-east of Mahé, La Digue is the fourth-largest inhabited island of the Seychelles and enjoys an extremely relaxed lifestyle. While there, take a stroll on one of the most photogenic beaches at Anse Source d'Argent, with its powder sand and pink granite boulders. To the north-west of La Digue lie the sister islands of Grande Soeur (Big Sister) and Petite Soeur (Little Sister), where a dive at Sister Bank is opportune. Before reaching Praslin, an idyllic stopover at Curieuse Island offers the chance to meet giant land tortoise. Sailing on to Praslin, 45km northeast of Mahé, visit the famous UNESCO World Heritage Site, Vallée de Mai National Park, home to the biggest coconut of the world, the so-called Coco de Mer. Anse Lazio, known as one of the best beaches in the world will astound even the most avid traveller. With half a mile of perfect, fine white sands and gorgeous turquoise waters, you will be hard-pressed to get back on the boat! 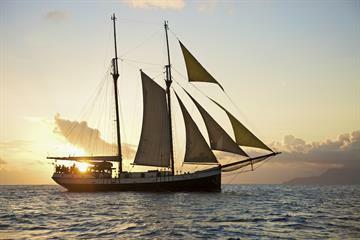 The Seychelles is a year-round liveaboard diving destination. The best months to dive are from March to May and September to November, when waters are the calmest and dive boats can reach the more remote sites. During these months the water temperature is at its warmest of 29 degrees Celsius (84 degrees Fahrenheit) and visibility remains good (up to 30m). The South-East Monsoon in July through to August brings strong winds and unpleasant surface conditions. Water temperature drops to around 25 degrees Celsius (77 degrees Fahrenheit) and the cooler waters attract the whale sharks searching for nutrient-rich plankton. The average air temperature yearly is between 24-32 Celsius. Currents vary between destinations and depths range from 8 to 30m. Additional liveaboards fees usually include gear rental (not covered), at 10 euros per dive. Some Liveaboards cater for a certain number of dives per trip, any additional dives and night dive incurring a surcharge. For non-divers equipment for snorkelling, kayaking and Stand-Up Paddle Boards (SUP), may be available depending on your choice of Liveaboard. Nitrox is not readily available onboard, please check with your dive operator. Every diver needs to purchase their own dive insurance. If you have any questions about extra fees in Seychelles, please contact us directly. Electricity voltage runs at 220-240 volts and uses the British standard square three-pin, 13 amp sharp electric plug. The currency is the Seychellois Rupee and the official languages are Seychellois Creole, English and French. International flights to The Seychelles depart regularly from around the world, usually landing at Seychelles International Airport, Victoria/ Mahé. Flights to the Seychelles are available on multiple airlines, such as Air Seychelles, Emirates Airlines, Etihad Airways, Air Berlin, Kenya Airways, amongst others. Air Seychelles offers frequent domestic flights between Mahé and Praslin. From the UK and Germany, expect at least a 13-hour trip. Flight times from the USA vary depending on whether you are flying from the West or East coast but can take between 18-30 hours. From Asia (Singapore), a minimum of 10 hours. Bear in mind that most Liveaboards incur additional fees for transfers to and from the boat. The Seychelles is a visa-free country meaning that there are no visa requirements for any person wishing to travel to this country. We recommend you check with your local embassy prior to departure. Valid Passport, proof of return and sufficient funds are required. A visitor’s permit is issued on arrival in Seychelles for a one month period. Please check your Liveaboard.com itinerary to confirm your port of departure prior to making travel arrangements. Seychelles Liveaboards depart from different ports, Mahé, Anse Possession-Praslin or Inter-Island Quay-Port Victoria. Budgets for Liveaboards range from 130 to 260 euros per person / per night. Additional costs for land excursions may be applicable. Some sites are situated within protected National Parks and may incur additional park conservation fees. Minimum logged dives of approx. 50 is recommended with OWD or equivalent facing restrictions to some of the dive sites. Check dives on Seychelles liveaboards are often held on the first day. The only recompression chamber in the Seychelles is on Silhouette Island with a permanent on-site hyperbaric medical physician. Silhouette island is reached by a 45-minute boat excursion or 15–minute helicopter transfer from the International Airport in Victoria/Mahé. There are no compulsory vaccinations for travel to The Seychelles, however, we recommend standard protection against Hepatitis A & B, influenza and measles. There is no risk of malaria in The Seychelles. A valid yellow fever vaccination certificate is required for those having visited infected areas within the preceding 6 days. All staff onboard are First Aid trained and there are health clinics in Mahé, Praslin, and La Digue. It is recommended that you drink only purified bottled water. Very good. Great visibility and current conditions for divers. Great! Marine life in general could be more preserved but we saw many fishes. Visibility wasnt very good. Not world-class diving but nice, easy, and super warm dives with plenty of colorful fishes and the occasional sharks, rays, and turtles. I saw lots of marine life and devastation of coral bleaching. The divings were average due to lack of colourful corals but the whale shark sighting made up to make it the best dive ever! Diving was ok, bad luck with the weather, hence the visibility.